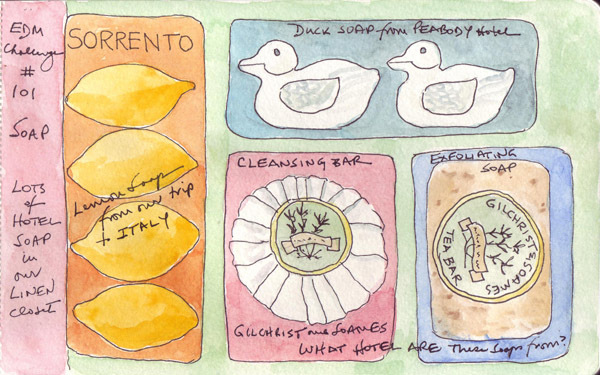 I buy soap less than once each year because the soap provided in hotels is so yummy. And the minute you open one bar, they replace it with a new one making it hard to resist taking the replacement home. Lemon trees are plentiful on the Amalfi Coast and everything comes in lemon-flavor. I bought several packages of these small soaps to bring home, but was disappointed that they really don't smell like I expected. The Peabody Hotels have live ducks that "march" into the lobby and swim in the fountain several times each day - making the duck the logo for the hotel. I couldn't resist these cute white soap ducks after watching the ducks for several days in the Peabody Orlando. I have no idea which hotel provided Gilchrist and Soames soap, but I haven't yet opened the cleansing bar or exfoliating soap. I'm about to enter the British Museum to see the exhibit "The Past From Above" - 100 aerial photos of the major archeologic sites of the world. In addition to the photos they had artifacts from the British Museum to supplement some of the images. 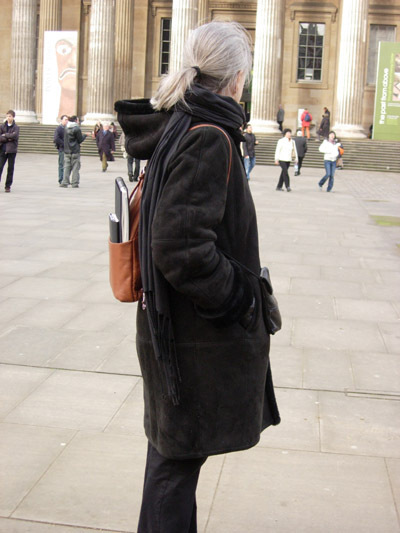 This photo of me shows my brown leather backpack with sketchbook and map in the back and small digital camera in a black leather pouch on the front. This has been a successful way for me to be a grandmother and tourist while sketching quickly and taking lots of reference photos. 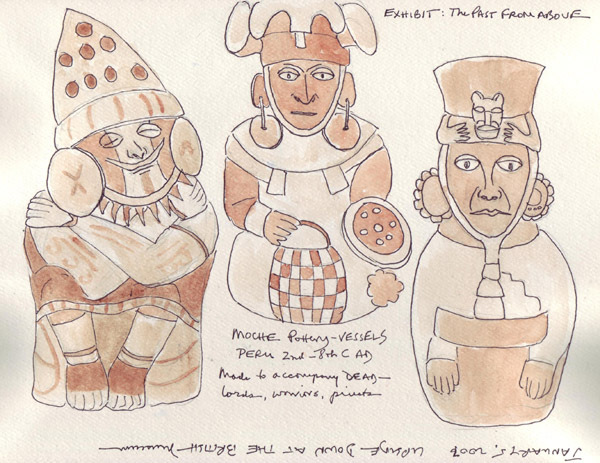 I was very attracted to these 3 pieces of Moche pottery that were together in a case next to an aerial photo from Peru. I sent my husband off for 30 minutes to work on a New York Times crossword puzzle from his pocket and sketched as quickly as I could. I was in such a hurry that I actually sketched it upside down in the journal. The watercolor was added at home using a reference photo that I took in front of the case. 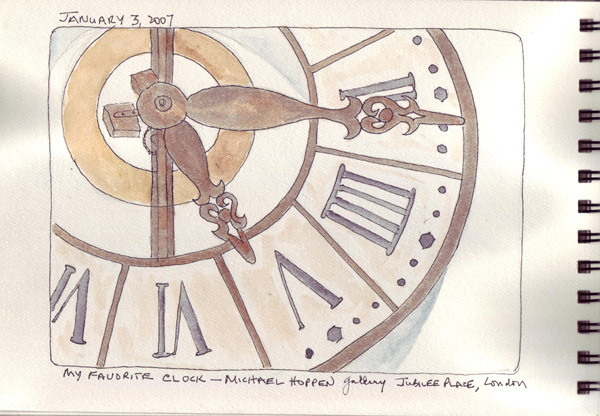 We returned from London yesterday so this journal page was scanned, not photographed. It was another great visit and I brought home many reference photos that I hope to use for sketches in my recycled Elizabeth I book. Last Thursday I met Katherine Tyrrell and several of the Society of Graphic Fine Art members for a sketch day at the Victoria and Albert Museum. I was delighted that they chose the Islamic Art Room - we saw it briefly when it reopened this Fall and I always meant to return to sketch some of the designs. I spent the morning analyzing a Turkish tile design followed by a Turkish bottle. We had canvas stools and I had my backpack with sketching tools, waterbrushes, and the Daler-Rowney cylinder of watercolor paints. I was delighted to be so comfortable sketching/painting and zoned out. I chose this Turkish tile design because it forced me to slow down and figure out the design which was symmetrical across the diagonal of the square. In the past I photographed magnificent mosaic tiles from the floor of the old Paris Opera House and appliqued quilt squares from the designs. This 16th C Turkish bottle was the most beautiful shades of blue. I loved the stylized flowers and also envisioned the design in fabric. My notes re: adding hot links in my blog are back in New York - so I'm just adding the link to Katherine's blog here because today's entry is from her visit to the Holbein exhibit, followed by the sketches from the V & A. I love reading all of Katherine's blog entries, and not only enjoy her journal sketches, but learn something about art everyday because of the research she does for each entry. We played tourist in London this week and visited the exhibit at Tower Bridge followed by a delicious Italian lunch in the Butler's Wharf building. 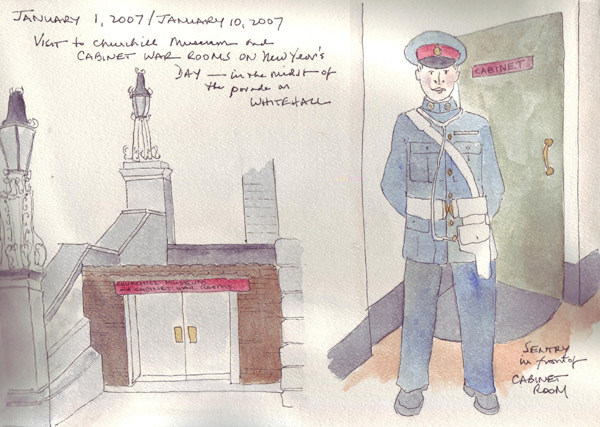 This morning there was a question about the Daler-Rowney travel watercolor set on the EDM message board, and I remembered that I had this rare photo of me - sketching a piece of Tower Bridge from the warm restaurant. Since I carry the camera, there are full vacations without any documentation that I traveled with my husband!